To frame out the context of this discussion, a Mormon had stated, "Comments regarding Luther...and the followers of Luther...are appropriate in here when Luther actually approved of the very thing that followers of Luther are coming in here to lambaste US over." The Mormon goal is to point out "hypocrisy, double standards, 'mote and beam,' etc." In essence, as I see it, the Mormon argument is: if the polygamist finger is pointed at the Mormon church, don't ignore the fact that the same finger should also be pointed at Luther. One old Roman Catholic writer captured the heart of this controversy, "Perhaps this juxtaposition of Luther and the Mormon may be offensive to some of his friends. But we shall have the occasion to prove that Mormonism may confidently look up to Luther as a patron." On this topic, Rome's defenders have been supplying ammunition to Mormon apologists for years. We'll see below this very Luther quote came from a Roman Catholic author hostile to Luther and the Reformation. It's easy to see why Mormons gravitate to this quote: it does indeed appear to present Luther as advocating blatant polygamy. Luther appears to be stating polygamy doesn't contradict scripture and that one should simply rely on their conscience and personal interpretation of "the word of God" to justify it. While I've been over this quote before, let's take a fresh look. We'll see that Luther was not advocating radical polygamy. We'll also see that the quote in context says something much different than the way it comes off in its propaganda form splattered all throughout cyberspace. The quote was cited as "Luter, Martin. De Wette II, 459, ibid., pp. 329–330." The person who provided the reference said it was taken from the website of a Christian group "extolling polygamy." Perhaps it was this one? The same exact reference in the same exact form is presented. Luther was an out-and-out believer in polygamy. To say that he did not "counsel" polygamy, or that he advised that it should be kept secret as a sort of matter of "conscience," is utterly beside the facts. When Brück, the Chancellor of the Duke of Saxe-Weimer, heard that Carlstadt in 1524 advocated polygamy he consulted Luther on the new and pernicious teaching. The Reformer, not in the least abashed, openly and distinctly stated: "I confess that I cannot forbid a person to marry several wives, for it does not contradict the Scripture. If a man wishes to marry more than one wife he should be asked whether he is satisfied in his conscience that he may do so in accordance with the word of God. In such a case the civil authority has nothing to do in the matter." (De Wette II, 459.) Many other clear statements wherein Luther sanctions polygamy might be reproduced here, but the one given above will suffice for the present. 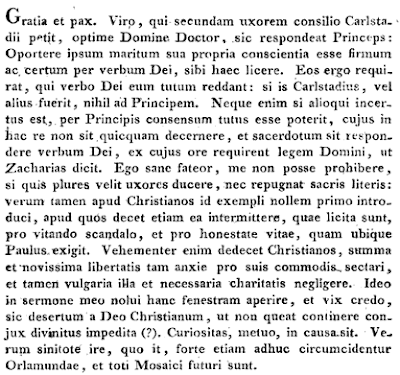 This is the opening paragraph of a letter Luther wrote to Chancellor Gregory Brück on Jan. 27, 1524. Brück was a political figure-head (and supporter of the Reformation) in Electoral Saxony (LW 49:50). The letter does include comments about polygamy. The second reference (not used by O'Hare) claims to be from the same De Wette volume, pointing to the earlier pages 329-330. These pages present Luther's letter to Spalatin, April 22, 1523 (the letter begins on page 329 and concludes on page 330). There is nothing though about polygamy in the letter, at all! If one does an online search for the phrase, "De Wette II, 459, ibid., pp. 329-330," you'll discover this bogus reference repeated throughout cyberspace, most notably in Wikipedia's page, Polygamy in Christianity (see footnote #38). "pp. 329-330" isn't a reference to De Wette II at all, but rather to the 1987 TAN reprint of Patrick O'Hare's The Facts About Luther, pages 329-330. Those are the pages in which Father O'Hare utilizes De Wette II, 459 and uses the quote in question. To my knowledge, there is no official English translation of the short letter presented in De Wette II, 459. Extended sections are available, typically from hostile Roman Catholic sources. For instance, Hartmann Grisar presents it, as does Audin. The following excerpt comes from Roman Catholic writer, J. Verres, Luther, An Historical Portrait, pp. 312-313. When the Latin text is consulted from De Wette II, 459, O'Hare's version is demonstrably odd. He has reversed the sentences. The first sentence actually appears further into the text ("Ego sane fateor, me non posse prohibere, si quis plures velit uxores ducere, nec repugnat sacris literis"). O'Hare's second and third sentences appear before it. O'Hare simply produced a sloppy summary of the opening of the letter, if it's his English translation at all. But there are greater problems with O'Hare's rendering. Luther was not simply saying, as O'Hare wants his readers to believe, that a person wanting to be a bigamist needs nothing more than a certain conscience to justify it. True, Luther does say that a person wanting a second wife needs to be sure of it himself ("Oportere ipsum maritum sua propria conscientia esse firmum ac certum per verbum Dei, sibi haec licere,"). Roman Catholic writers have jumped all over this. What O'Hare and many of Rome's defenders leave out is Luther's emphasis, that the prince had no jurisdiction in such a matter because "It is the duty of the priests, to answer with the word of God." Grisar's English version renders it as "For if the fellow is not sure of his case, then the permission of the Prince will not make him so; nor is it for the Prince to decide on this point, for it is the priests business to expound the Word of God, and, as Zacharias says, from their lips the Law of the Lord must be learned. " Luther is not simply saying to look into your heart and then do what you want. He's saying that secular authority should not decide on the matter, but rather spiritual authority. This paradigm was used later by the Wittenberg theologians during the Phillip of Hesse scandal. Phillip sought permission from theological leaders to take a second wife. ...but I would not that such an example should be introduced amongst Christians, who ought to omit even lawful things for the sake of avoiding scandal and leading a pure life, as S. Paul demands. For it is very unbecoming to Christians, eagerly to pursue, for their own comfort, their liberty to its last consequences and yet to neglect the common and necessary duties of charity. Therefore I have not in my preaching opened this window, and I hardly believe, a Christian can be so far abandoned by God, that a man who by God's action is hindered (from the use of conjugal rights) should be unable to contain himself. But let things go where they go. Some of the radical Anabaptists undertook to introduce polygamy, appealing to the patriarchal order of society in justification of their position. Even among Luther's followers and associates there was no little uncertainty about the matter, as was not altogether surprising when the old order of things was undergoing revision at so many points, including the marriage of monks, priests, and near relatives. But Luther himself was unalterably opposed to any such revolution. Monogamy he considered, under ordinary circumstances, alone tolerable in a Christian community, and held that no Christian ruler has any moral right to legalize polygamy. At the same time, finding no explicit prohibition in the Bible, he believed exceptions might be allowed in certain extreme cases such as are now generally recognized in Protestant countries as justifying divorce. Writing Chancellor Bruck about the matter in 1524, he said: I confess I am not able to forbid anybody to take more than one wife if he wishes to do so, nor do the sacred Scriptures forbid him. But I do not want this custom introduced among Christians, for it behooves them to give up things which are permitted, that scandal may be avoided and honorable living promoted, as Paul everywhere demands. Was Luther the "patron saint" of Mormon polygamy? Hardly. While one could disagree with Luther's exception in regard to bigamy or while one could easily say Luther was wrong to even offer an exception, it's simply historically inaccurate to say Luther supported bigamy or polygamy in a Mormon sense. Had a Mormon defender read this quote in context, the difficulty in squaring Luther's view with their view is easily seen. I think it's ridiculous for Mormon apologists to use Luther on this issue. They paint him as some sort of all out polygamist, where, as I've studied it, Luther's dabbling in polygamy was typically hypothetical and cautioned, or out right denied. True, Luther got himself into mess with the scandal of Phillip of Hesse, but even in that, he was reluctant to authorize the bigamous relationship Phillip wanted. It wasn't like he was looking to allow Phillip to have a good time with two wives. When the entire situation was exposed, Phillip's supporters began writing books defending polygamy. Luther then wrote things like, "Anyone following this fellow and his book and takes more than one wife, and thinks that this is right, the devil will prepare for him a bath in the depths of hell. Amen" (Martin Brecht, Martin Luther the Preservation of the Church Vol. 3 1532-1546 , p. 214). Here's a conversation with one of Rome's defenders from the CARM Roman Catholic board on Luther and Romans 3:28. I began saving these interactions because they tend to vanish, There was no editing. Nope. Luther had a very different meaning of "faith alone". It was NOT taught by any of the Fathers you mentioned. Luther was trying to use language to justify his inclusion and changing of the meaning of the Scripture. That's unfortunate. All one has to do is look at how he treated the canon of Scripture, deciding which books of the Old and New Testament that HE thought were inspired. How's that for someone thinking THEY alone can determine which books are inspired and which are not. And yes, he rejected New Testament as well as Old Testament books as not being inspired. Nope. Luther had a very different meaning of "faith alone". It was NOT taught by any of the Fathers you mentioned. Luther was trying to use language to justify his inclusion and changing of the meaning of the Scripture. Your zeal for your beliefs and defense of Rome is duly noted, and appreciated. The following comments are based on a CARM debate on this topic I had back in 2008. In his An Open Letter on Translating: "So much for translating and the nature of language. However, I was not depending upon or following the nature of language when I inserted the word "solum" (alone) in Rom. 3 as the text itself, and St. Paul's meaning, urgently necessitated and demanded it. "Luther inserted his own theology into the text. When Luther says, "urgently necessitated and demanded it," this is exactly what the point is in bringing out the fact that others previous to Luther saw the intent of the text. Luther approached the work of a translator honestly. If Luther was attempting to radically distort the New Testament, his work failed in many ways. Luther did not add the word “alone” to Galatians 2:16, nor did he remove “alone” from James 2. Even in his revision of the Latin Vulgate, Luther left the Latin of Romans 3:28 as it was, because the contrast was apparent. The entire Roman Catholic crusade against Luther on this issue is entirely unjustified when evaluated by their own paradigms. To my knowledge, there was not any official dogmatic statement prohibiting Luther from either translating the Bible or translating Romans 3:28 as he did. There was not an infallible interpretation of Romans 3 during Luther’s translation work. Until such dogmatic declarations, those throughout church history previous to such cannot be held anathema for their positions or interpretations of Biblical passages. Further, there wasn’t a defined Roman position on Justification previous to Luther. Roman Catholics cannot even indict Luther’s understanding of justification, because previous to Trent, there was not “one” Roman Catholic understanding of justification. Hello James. Your zeal in defending Luther and his theological novums of the 16th century is duly noted, and appreciated. As I have stated already, Luther admits he did not use the rules of language as the basis for adding the word alone. "However, I was not depending upon or following the nature of language when I inserted the word "solum" (alone) in Rom. 3 as the text itself, and St. Paul's meaning, urgently necessitated and demanded it." Also, please note that Luther wasn't authorized to translate the Bible. This is not a small point. I think you would agree that translations matter. If they don't, then there's no reason you would discourage someone from using the New World Translation. You also seem to disregard Luther's disregard for 7 books of the Old Testament and 4 books of the New Testament. Luther was excommunicated and declared a heretic for many issues including his insistence on sola scriptura and setting himself up (and every individual) as the private judge of faith. There is no "crusade" against Luther to posthumously anathematize him. One should be more concerned about Luther's crusade against the Church Christ founded. It wasn't a reformation, it was a rebellion. Hi Mark: It would be prudent to read Luther's Open Letter on Translating with a careful eye. Luther's intention was to translate the Bible into an easily comprehended form of popular German. His translation at times employed forms of dynamic equivalence, as many translations do. Word-for-word translations can be cumbersome and awkward, and not appealing to average readers. Rather, many translations seek to maximize readability with a minimum of verbal distortion by translating according to "concept." In translating Romans, Luther tried to present the "impact" of what the original Greek had on its first readers, and to present the German style and idiom equivalent for his readers. An honest translator, Luther freely admitted (in the very Luther document you're citing) the word "only" does not appear in the original Greek at Romans 3:28. He states, "I know very well that in the original text this word does not occur. Nevertheless it belongs in any good German translation... Whenever we place two things in opposition and want to make clear that we acknowledge or accept the one and reject the other, we use the word 'only.' "The farmer brings no money but corn only.' 'No, at the moment I really have no money, but only grain.' 'I have only eaten, but not yet drunk.' 'Have you only written, without rereading?' This is the form which we use in countless expressions: over against 'not' or 'none' we have the word 'only,' to make the contrast clear." Also, please note that Luther wasn't authorized to translate the Bible. This is not a small point. I think you would agree that translations matter. If they don't, then there's no reason you would discourage someone from using the New World Translation. First, let's visit your worldview for a moment. I'm a bit rusty on my infallible Roman decretals, so perhaps you can refresh my memory as to the infallible standard on who was and was not allowed to translate the Bible during Luther's day? If I recall, it wasn't until Trent that the Latin Vulgate was formally affirmed as Rome's official version. FYI: Most of Trent took place after Luther's death. Now let's play in my world for a moment. You've seemingly appealed to your ultimate authority (Rome) as that which sets the rules as to who, or who cannot, translate the Bible. I don't accept that ultimate authority. In fact, the ultimate authority of Rome never sanctioned the very Bible Jesus used. 1. Unless Rome authorizes a translation of the Bible, translations do not matter. 2. Unless Rome authorizes a translation of the Bible, then the New World Translation is an acceptable translation. You also seem to disregard Luther's disregard for 7 books of the Old Testament and 4 books of the New Testament. I only casually visit CARM. If this was part of the discussion, I did not come across it, so my apologies. In regard to disregarding, I've written about Luther's canon numerous times, both here and elsewhere. A simple Google search would demonstrate that I've not disregarded Luther and the canon. Luther was excommunicated and declared a heretic for many issues including his insistence on sola scriptura and setting himself up (and every individual) as the private judge of faith. Where? In the Edict of Worms? That was the most important document that declared him a heretic. 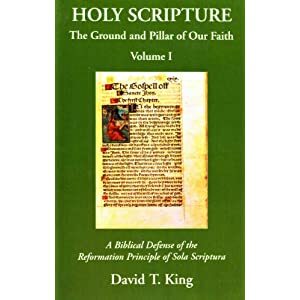 Read the "Items" in the Edict, Where was Luther condemned for "sola scriptura" and "setting himself up (and every individual) as the private judge of faith"? Perhaps you're reading the document differently than I am, or perhaps I simply missed these points in my old age. These three sentences of yours comprise merely your personal opinion. Each lacks substance, presenting your feelings. Similarly, I present my feelings: There is a concerted effort from some of Rome's defenders to continually attack Luther. One should be more concerned with bringing Rome back into Christ's church than with attacking Luther. There was a Reformation in the sixteenth century to overcome Rome's rebellion against Christ's church. I have. All of your appeals to the German language mean nothing because Luther freely admits, as I have quoted, that he was not following the rules of language when he inserted the word alone. He did it because he believed that Paul meant to say alone. The Church must approve any translations of the Bible. I suggest you look at John Tyndale, who was prior to ML, for more information. What Bible did Jesus use? The Jews didn't have a closed canon until after 100AD. I know you don't accept the authority of the Church. I am asking you about the New World Translation. Is it an acceptable translation to you? Who decides what is acceptable and what isn't? What about the KJV? Some say a Christian can ONLY read the KJV. The point is that you have no authority to say this translation is accepted and this isn't. Everything in that edict stems from him setting himself up as the private judge of faith from the Scriptures alone. The Catholic Church is Christ's Church. We pray for and welcome the day when Protestants have unity with the Catholic Church again. I think the Joint Statement on the Doctrine of Justification between Lutherans and Catholics was a step in the right direction. God bless. "...it is entirely possible Luther's understanding of "faith alone" differs from those before him... but that is not the issue. The issue is whether or not the thrust of Romans 3:28 implies "alone." Others previous to Luther may have differed in theological interpretation, yet they saw the thrust of the words in context implied "alone." So, whether or not Luther had "a very different meaning" is irrelevant. Did you know even some Roman Catholic versions of the New Testament also translated Romans 3:28 as did Luther? The Nuremberg Bible (1483), "allein durch den glauben" and the Italian Bibles of Geneva (1476) and of Venice (1538) say "per sola fede." That you were misreading Luther should have been blatantly obvious, as he previously in the text does provide exegetical reasons for translating the verse the way he did. For whatever reason, you're fixated on a less-accurate English rendering of one sentence at the expense of the overall context. This sort of myopic misinterpretation of a basic text only leads me further away from Rome. It's the sort of interpretation that would have provoked Luther to use the old adage, "Sic volo, sic jubeo; sit pro ratione voluntas" (LW 35:185). It's the sort of interpretation that shows with clarity that Rome's defenders cannot see past their own biases as to what a text plainly says. Where, in Luther's day, was this infallibly stated? Why wasn't it until Trent (after Luther's death) that the Latin Vulgate was formally affirmed as Rome's official version? Jesus appears to have used the Septuagint. Are you trying to say that until the entire New Testament was written, there was no actual Bible? Are you inferring that until Rome "authorizes" a Bible, there is not actually a Bible? If so, wow. That's a good question, though tangential to your "Luther" ruckus on Romans 3:28. Briefly then, God has gifted his Church with a myriad of ancient manuscripts that collectively preserve the original text. Subsequently, He's provided humanity with those who have been gifted in linguistics and translating. THE NWT, when juxtaposed against both of these, falls short. As I suspected, you don't appear to have any idea of what the Edict of Worms states. Your saying, "Luther was excommunicated and declared a heretic for many issues including his insistence on sola scriptura and setting himself up (and every individual) as the private judge of faith" is simply a repeating of an accepted modern narrative put forth by Rome's defenders at the expense of historical documents. That's fine to finish with your opinion. Here then is mine: The Roman sect needs to repent and fall under the authority of the Sacred Scriptures. This does not necessarily mean that all those with allegiance to Rome are not part of the Catholic and universal church. There may be those within Rome that embrace the righteousness of Christ alone, but this is despite Rome's official teaching. Last edited by James Swan; 09-03-18, 12:23 PM. The Roman sect needs to repent and fall under the authority of the Sacred Scriptures. It already does, in case you didn't know. It is authoritative as theopneustos, God breathed. Nothing the Church teaches is contradicted in Scripture. But let's assume you meant the authority of Sacred Scriptures allein. How exactly would that work? Whose interpretation of Scripture should the Church rely on? Lutheran? Reformed? Pentecostal? Methodist? Mormon? Baptist? Which Protestant group claims infallibility? I am a convert to the Catholic faith because I realized that I was basing my beliefs on my own personal opinions of Scripture or on the fallible opinions of Protestant ministers. That's not how God intended it or Christ set it up. It is ultimately an unworkable way to understand the Christian faith. Last edited by Mark Rome; 09-03-18, 01:12 PM. I am a convert to the Catholic faith because I realized that I was basing my beliefs on my own personal opinions of Scripture or on the fallible opinions of Protestant ministers. That's not how God intended it or Christ set it up. It is ultimately unworkable to understand the Christian faith. Mark: When you joined Rome, that was also a personal choice you made based on your belief and your own personal opinion. You had to choose this infallible interpreter over that infallible interpreter. "The fact is, he had to engage in the very same principle of private judgment that we all must use to decide among the various options; namely, a thinking, objective reasoning process, apart from reliance upon the system to which he would eventually subscribe. But it is that very same principle of private judgment that leads him to Rome and others of us away from Rome. Certainly Rome condemns the decision we reached, but she cannot condemn the principle we used to that decision, since it is the very same principle that all Roman Catholics must use to decide that Rome is the 'true' church. The Roman Catholic cannot introduce a double standard at this point and still be consistent." [Source: Eric Svendsen, Upon This Slippery Rock, 34]. Thus, the Catholic convert used private judgment and private interpretation to choose Rome, but in the next breath condemns the Protestant for using private judgment and private interpretation. Once again, I do appreciate your zeal, and I do not mean that mockingly. It's just not a tenable position. Mark: When you joined Rome, that was also a personal choice you made based on your belief and your own personal opinion. You had to choose thisinfallible interpreter over that infallible interpreter. The thing is, James, you do not have an infallible interpreter. I do not claim to be infallible, but it doesn't follow that the Church isn't infallible. The question everyone must answer is "How do you know what the Christian faith is?" It is everyone's responsibility to examine the truth claims of the Catholic Church. Some haven't (yet) recognized the truth claims of the Catholic Church either through ignorance or through deeply ingrained biases against the Catholic faith. Some may be obstinate about it, but I am not their judge, God is their judge. I do sincerely appreciate your zeal to defend Martin Luther. Had he been a true reformer, it's quite possible that he would be Saint Luther in the Church today. Yours just is not a tenable position. Blessings. Mark, you made a fallible personal decision as to which infallible interpreter you desired to follow. You could have chosen a number of alleged infallible interpreters.... The Mormon church, the Jehovah's Witnesses, etc. There's a confusing number of infallible interpreters out there, all claiming to speak infallibly for God. The question for you to consider is one posed by Eric Svendsen many years ago..."How can you be certain that you are in the truth since all you have to go on is your own fallible private judgment that Rome is right?" I realize your "sincere appreciation" is a spin on what I wrote previously. Ah well, I really did mean it. It takes a lot of courage to defend Rome in a hostile environment. It doesn't take any such courage for me to post here about the Reformation. In regard to Luther, it appears I was able to respond to your charges in such a way as to shut the Luther part of our interaction down. Luther's Open Letter on Translating is one of my favorite Reformation documents, thanks for presenting the opportunity to revisit that writing. Actually you didn't. As I have quoted, Luther admits that he added the word alone because he felt that St Paul's meaning "urgently necessitated and needed it". You can argue all you want about how it was just a sincere language issue, but you can't get around Luther explaining that he is the one who understands what Paul meant. To quote him, "Dr. Martin Luther will have it so and he says that a p0pe and an *** are the same thing." I too like Luther's Open Letter on Translating because it is apparent for all to see just how arrogant he was and how he placed himself above all in translating Scripture. I can see that Luther took great liberties with the Scriptures, can you? It was a pattern of his, including mutilating the Bible and casting doubt on inspired books. If a Luther came along today and did something similar, he would be shunned by most all, probably including you. Actually you didn't. As I have quoted, Luther admits that he added the word alone because he felt that St Paul's meaning "urgently necessitated and needed it". You can argue all you want about how it was just a sincere language issue, but you can't get around Luther explaining that he is the one who understands what Paul meant. To quote him, "Dr. Martin Luther will have it so and he says that a p0pe and an *** are the same thing." I too like Luther's Open Letter on Translating because it is apparent for all to see just how arrogant he was and how he placed himself above all in translating Scripture. I can see that Luther took great liberties with the Scriptures, can you? It was a pattern of his, including mutilating the Bible and casting doubt on inspired books. If a Luther came along today and did something similar, he would be shunned by most all, probably including you. I am willing to look at Luther's "great liberties with the Scriptures," in fact, I could list a number of ways in which I disagree with Luther or find him at fault. The problem is, first, you have not made a compelling case on Luther and Romans 3:28. I've demonstrated you overtly misread Luther. You provided no coherent counter response to the information I provided. In fact you avoided it and then simply restated your refuted position above in this response. Repeating the same thing over and over again reminds me of the old song by Genesis, "I know what I like, and I like what I know." Nope. Luther had a very different meaning of "faith alone". It was NOT taught by any of the Fathers you mentioned. Luther was trying to use language to justify his inclusion and changing of the meaning of the Scripture. That's unfortunate. Luther was not the devilish translator you're slandering him to be. It's within the realm of possibility to use the word "alone" in Romans 3:28 in translation. Fitzmyer saw this. Why can't you? What would you really be giving up by simply letting the facts fall where they will? Simply admitting that it's within the realm of proper translation to use the word "alone" is not conceding that Luther's "sola fide" is right. This does not follow. After producing the list to substantiate Luther's point, Fitzmyer goes on to say, "Even so, one must further ask whether Luther meant by 'only' what his predecessors meant" (p.362). Perhaps you missed it when I also previously stated, "it is entirely possible Luther's understanding of 'faith alone' differs from those before him... but that is not the issue. The issue is whether or not the thrust of Romans 3:28 implies 'alone.'" Paul did not intend to say "faith alone" in Romans 3:28. If he had, he would have written it. You've already admitted that Luther through that Paul meant to say "faith alone". You've also agreed that the word alone isn't in the Greek. This is why the Church is very careful with Bible translations. Guess what? The Church even burned bad translations of the Bible. You know what? If I see a copy of the NWT translation at a used book store, I would buy it and burn it rather than have someone unsuspecting buy it and be led into heresy. Paul was the most prolific writer of the New Testament when it comes to faith and not once did he use the phrase "faith alone". If he wanted to say we are justified by faith alone, he would have. But he didn't. Since your time is limited, I'll let your song be the your "swan song" I am sure you will respond so I'll let you have the last word since my time is limited too. Blessings.